Choose from a variety of options and packages, and learn about our policies. Be sure to register early to lock in some of our best prices ever! Riders can choose from several bike route options that vary in distance and difficulty. All routes are hand-selected, thoroughly tested, and fully supported. 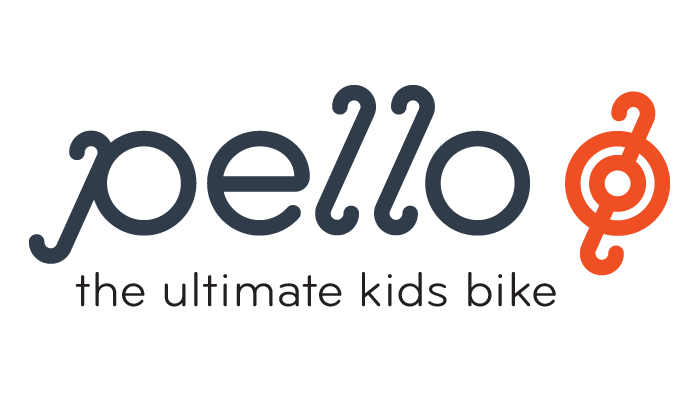 We are a non-profit that works to inspire biking for recreation, health, tourism, and the environment. Support our mission by looking and feeling good at the same time. 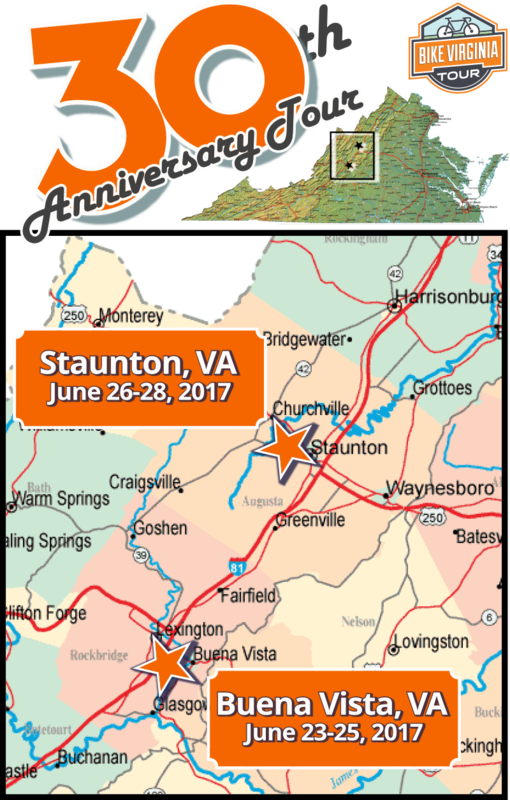 WOW 2017 marks 30 years of touring Virginia with amazing bike enthusiasts just like you! Bike Virginia has seen almost all of the state in our long history of exploring Virginia by rural back roads. We know you will find this area of the Shenandoah Valley beautiful and historical, and completely unique to Virginia. Learn everything you want to know and more. Just click one of the six colorful page buttons above to start… you’ll be glad you did! We will start the 2017 tour in the Lexington region, with our headquarters in Buena Vista. This wonderful area has been host to our event 5 times in the past 30 years because of all the great things it has to offer. For those who took part in our 2013 tour you surely have fond memories of the kind people, scenic back roads, and deep cultural heritage. 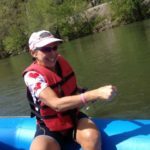 In 2017, we return to the same very popular base camp at Glenn Maury Park in Buena Vista (3 mi from Lexington), located right next to the Maury River. This location boasts convenient access to the interstate, full RV hook ups, great tent camping, a grand dining pavilion, lots of shade, and access to the river onsite. This location is home to the event Friday, Saturday, and Sunday. Monday morning, the second half of the event will be hosted in Staunton Virginia, one of the state’s most popular travel destinations. Headquarters will be at Staunton Crossings, a location convenient to I-81, local hotels, and downtown Staunton. This site offers lots of space and ample on-site parking for cars and RVs. Please note, there are no RV hookups at this location. Information (including street addresses) on our Event Headquarters can be found on our SLEEP page. Don’t have a way to easily get your bike from here to there (and back? )… we’ve got you covered! 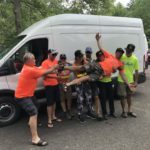 Shenandoah Bicycle Company provides bicycle shipping for the 2017 Bike Virginia Tour. Just contact Thomas Jenkins (see below) for more information. Professional bike assembly services onsite (and bike rentals) will also be available. If you don’t own a bicycle, or would rather not bring your own, rentals are the way to go! How it works: they will make sure your rental bike is available onsite and ready-to-ride at the start of the tour, and provide any and all maintenance during your stay. All you have to do is show up! (How convenient is that?) Please note that quantities are limited, so be sure to make your reservations in advance. Just contact Thomas Jenkins @ Shenandoah Bicycle Company for more information. Returning for 2017, our Double Vision format gives you more riding options, access to your car (and stuff) the entire time, and no one-way routes! Be sure to read about all the exciting changes that come with the Double Vision format. Thank you for considering Bike Virginia. We promise to deliver you a unique and pleasurable riding experience in the Bike Virginia way. We realize that we are not exactly like the Bon Ton Roulet, Bike Florida, Ride the Rockies, or Cycle North Carolina. Because of those differences and the geographic location our price is different. There are a lot of great events. We hope you will find the same level of enjoyment at ours. Many riders do both. The proceeds from our event (which are very meager) are used to do advocacy work and education as directed by our 11-person board. We serve as consultants to localities, work on legislative issues, conduct share the road education, and operate an informational website about cycling in Virginia. Why do some events cost less? We plan a completely new event each and every year! Accomplishing that takes 14 months with only 4 full-time staff. It is often difficult to compare other events with ours directly. Annual expenses for operating our event average $450,000–600,000. We look at price very carefully and charge only what we need to stay in operation and provide services for making bicycling better.